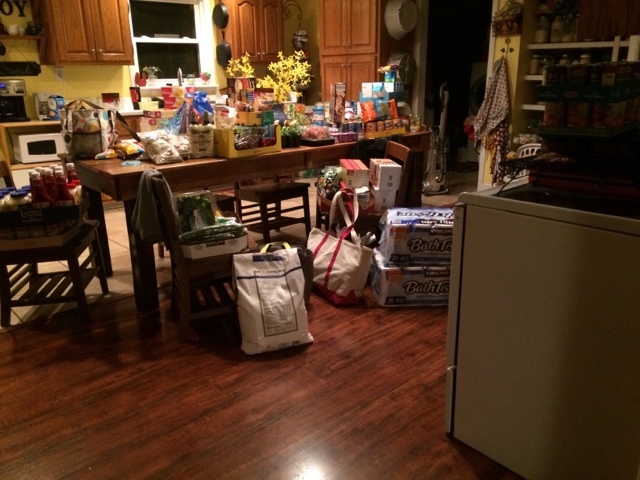 Buying in bulk is something that many don't think too much about. I know several families who buy just what they need when they need it, whether that be daily or weekly. For me though, I prefer to try and save up and buy in bulk and then when I need something, I shop my pantry. I can tell you, most of the time, I end up forgetting something and either have to do without it or get it from a local store. But if I am organized and ready, I tend to have a better, more fruitful experience. I have three places I shop on my big day. On my weekly shopping trips, I go to a local farm stand, my milk man, and occasionally to the grocery store or Walmart if there is something that I am in need of that I do not have... and monthly I try to order from a food co-op that we belong to. Costco is a great place for me because I do want to buy two packs of 30 rolls of toilet paper, I do want to buy 25 lbs of flour for under $6, I do love to buy the bulk bags of shredded cheese, and I do love the rotisserie chicken... just to name a few! Bulk purchases like these make Costco a wise choice for us. Aldi is probably my most favorite store though, and truly I think I COULD shop here and forgo Costco if I decided to give up my membership. I get a bunch of everything at Aldi. Aldi has incredible prices and since I only shop there once every several months, it makes sense for me to make the trek to our closest one available and stock up. The health food store that is fairly close to my husbands work is another store that is a great place for me to buy from. They carry the 5 gallon buckets of wheat that we use, they carry organic sugars, local honey, and a lot of all natural items and seasonal produce. I spent about $200 at Aldi on my last trip, (several months ago)... and I got many things that I will be able to have on hand to use daily and to plan my menu for the months ahead. How often do we 'run to the store' and spend $50 or more? Even when I do plan and bulk shop this happens to me! I know how easy it is to do! I've heard a friend say that they go in for one item and come out with no less than $50-$100. 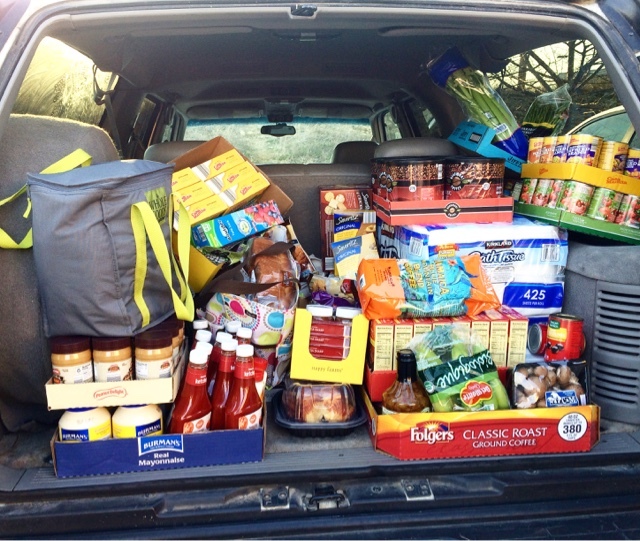 Give some thought to trying a bulk shopping trip. Here's a few tips to help you get ready. Begin making your list of items you will want, items you use a LOT of, and items you may want just for convenience, and items that you use a little. Get familiar with your list. Don't run to the grocery store for a while. Save those dollars back and use up what you have. You may feel that you get down to bare bones, and that is ok. You will have room and money for your trip. Start a weekly or monthly menu plan. That way you will have an idea for what you are going for and your goal. Compare! Know your prices. If you know you are going to save a ton at one place on a particular item, then make an extra stop. Be a sharp and smart shopper. Make an ongoing list of prices. If you are a list maker like me, this will make things even more happy. Check prices, make notes of them. You will see many things increase and maybe even decrease between trips... most likely increase. When you have an opportunity to stock up, do it. If you find a huge deal on something and you have the space and you know you use it often, buy a little extra and store it! This is a HUGE help in our family. We found an excellent deal on chicken legs one day. I bought 40 lbs for just a few dollars!!! I came home and put some on for supper that night and then vacuum sealed the rest for the freezer! Many suppers meat was supplied in that purchase. Don't buy on impulse too much. If you won't use it... don't buy it. No matter how good the deal. If you don't use it, it is going to be a waste of your money. I know there are tons of other tips out there, but these are a few of mine. You may be a small family or a single, I still think bulk buying is beneficial, but it's all up to you. Do what works for your family. Let me know if this is helpful to you. I'd love to hear from you! Chas, I agree with you! My family and I have bought bulk for years and works so well for us. It's been God's blessing for our family during hard times and good times. Oh how I miss Aldi:) Costco is my best asset here in Hawai'i. I do an early month run of $800 or so then I have a $50/day budget for the rest of the month, this is working better. I appreciated your post:) I'm cooking for 15:) I recently scored 4lbs chicken thighs for $3.98 I bought 12 bags:) that's a great price here:) thanks again for posting!! You are so right! Buying in bulk saves so much money! I use Aldi, Sams, Kroger and two food co ops. Thanks so much for sharing!! I need to get back to only shopping once even couple months!